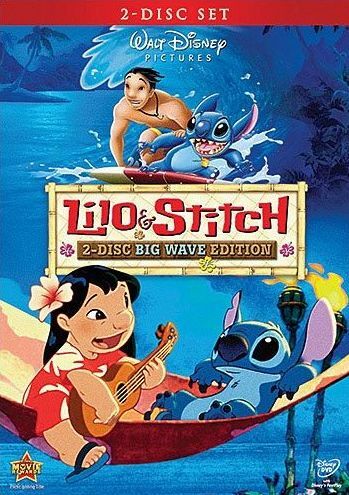 Lilo & Stitch was recently re-released in a 2-disc DVD version, and while it may not be considered one of Disney's classics like Sleeping Beauty or Pinocchio, I personally think it's much more enjoyable to watch than those. Fairies and princesses and magic have been replaced with space aliens and a mad scientist and a broken but loving Hawaiian family consisting solely of little Lilo and her big sister Nani. After their parents died, it became Nani's responsibility to support them both, and that's quite a challenge considering Lilo's bad attitude. 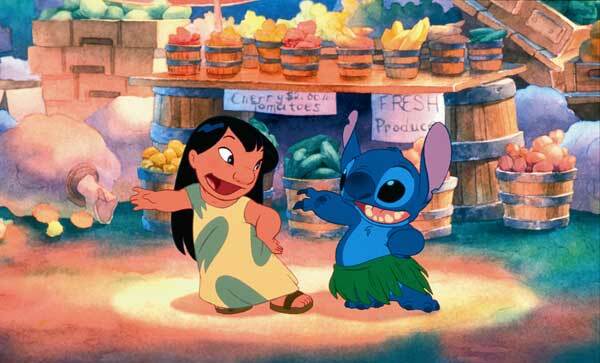 It's not like Lilo doesn't try to be positive, but it can be so hard, especially when the other kids make fun of her. And to make things worse, now there's a big mean-looking CPS agent named Bubbles breathing down Nani's neck, just waiting for her to mess up enough so that he can pull Lilo out and put her in a foster home. Wow! As if that wasn't hard enough, now their going to add a little blue space alien into their broken family?! Yep, though they aren't aware he's an alien at first. 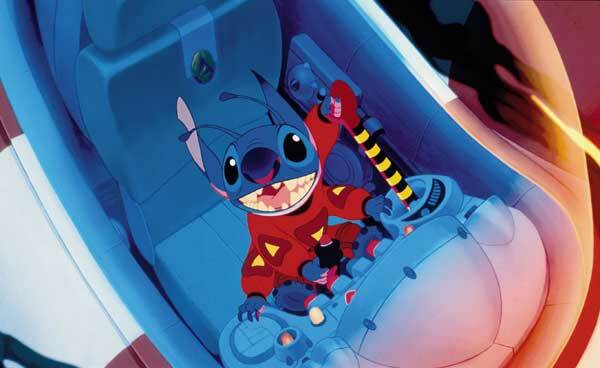 Stitch, created by a mad scientist for the sole purpose of destruction, escaped his limited imprisonment and wound up crashing to Earth where he is eventually knocked unconscious after being run over by a big rig. Yep, that lil' dude is tough! He awakes in the pound, where Lilo has come to pick out a dog, and of course she gravitates to Stitch, who looks more like a weird blue koala bear than a dog. At first, Stitch does exactly what he was designed to do... destroy! He claws and eats almost anything he can get his paws on, much to Nani's frustration. But Lilo doesn't give up on him, because now he's family and family always sticks together. And I think also that she sees a lot of herself in Stitch, an outcast with nobody else who frequently ends up in trouble. So despite his troublesome manner, or perhaps because of it, the two grow close and actually make each other happy. 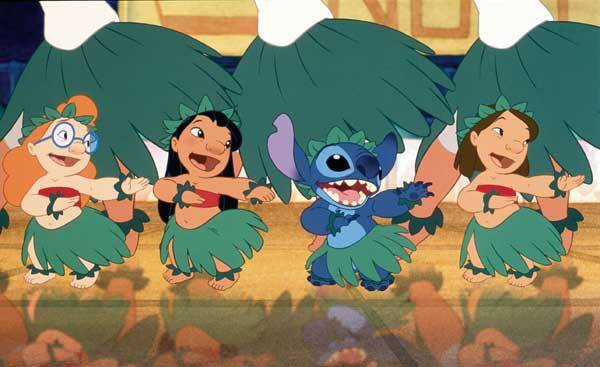 Lilo even shows Stitch how to play the ukulele. But were not quite at that happy ending yet! Remember how I said he escaped? Well, two aliens were sent to track him down and bring him back... discretely. One is the mad scientist who created Stitch, while the other is a nerdy bureaucrat guy who is obviously not accustomed to field work. Their attempts to apprehend Stitch constantly fail and usually end up causing some kind of minor disaster, so when their time limit is up, another alien is sent to finish the job, and he is not concerned at all with being discreet! There are hard times ahead, but needless to say love will win out in the end. This is a Disney movie after all! The two disc set is packed full of bonus features. Audio Commentary - One of the better commentaries I've heard, very informative all the way through, never boring. You're going to want watch the movie while listening to this. Your "Ohana" Music Video - Just a music video consisting of scenes from the movie. It's not bad. 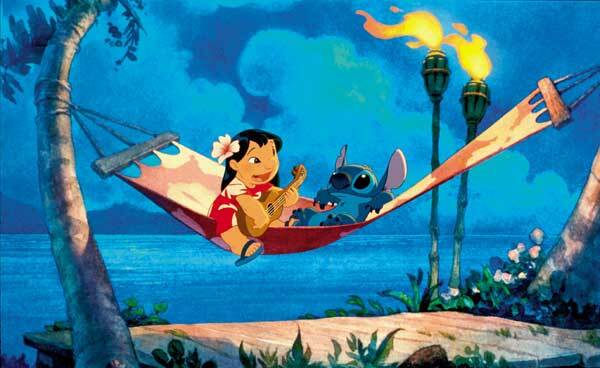 DisneyPedia: Hawaii - The Islands of Aloha - Short featurettes about each of the Hawaiian Islands (Molokai, Lana'i, Oahu, Kauai, and Maui) narrated by Nani and Lilo. Kinda interesting. Create Your Own Alien Experiment Game - A multiple choice quiz game about the movie narrated by the evil scientist guy. A Stitch in Time: Follow Stitch through the Disney Years - A bogus history of Stitch where they pretend like he was an actor trying to get into Disney movies, so they insert him into various still from other Disney films. Kinda lame. Hula Lesson - Yep, learn how to hula in only three minutes! Burning Love - Behind the Scenes with Wynonna - Short featurette about Wynonna Judd recording Elvis' "Burning Love" for the movie. "I Can't Help Falling in Love With You" music video performed by A-Teens - Another song redone by someone else, this time some band called the A-Teens. Corney, and very, very short (which in this case, is good). It's literally like a minute long. Animating the Hula - Another short featurette, this time focusing on how the hula scene in the film was animated. "Inter-Stitch-ials" Theatrical Trailers - Trailers for the movie, which are usually like who cares, but these are quite funny. They make it seem like a trailer for "Beauty & the Beast", "Aladdin", "The Little Mermaid" and "The Lion King", but then throw Stitch into the mix. Documentary - This definitely required it's own disc because the thing is just over two hours long and covers pretty much everything dealing with the creation of this film, starting from the very beginning and going all the way up to the premier. Tons of interviews with way too many people to mention, and all in different places with the people doing different things, not just everyone sitting in a chair with a nice background set up behind them. It covers original versions of the story and how it changed and how current events altered the film. And it's not just he making of the film, it covers the marketing and the toys and tie-ins with the fast food places. 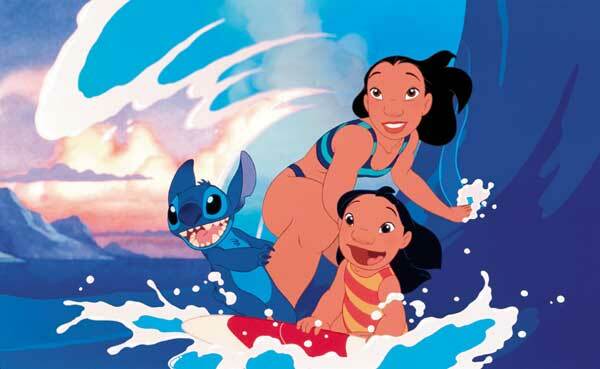 It's a very good documentary about Lilo & Stitch and definitely worth checking out. Documentary Footnotes - these are kind of like clips that didn't make it into the documentary which show even more insight, including deleted scenes... and there are quite a few of them. Also includes the trailers that were on the first disc. Deleted Scenes and Early Version Scenes - A bunch of deleted scenes... which also seem to be contained in the documentary footnotes section. So just two was to access the same stuff, which is good, as there's no need to go through the other footnotes when all you're looking for is the deleted scens.